We are the best choice when you need strata painters in Sydney providing a full range of painting services. We have the necessary management skills to carry out any strata project, enabling us to give strata painting Sydney for different types of buildings – single level, multi-level, modern high rises, small apartment buildings, large and complexes and various kinds of multi-residential living. Our extensive strata management painting skills and experience, we can paint all areas, interior, and exterior. You can come to us if you need advice or assistance. At A One Korean Painting, we have a team of craftsmen, technicians and painters have many years of experience in painting so that you can rest assured knowing that your strata painting will be accomplished with excellent results. We are a fully equipped company when it comes to strata painting Sydney. This is because we can provide you with peace of mind with the right painting job is being done with superior service, at the right time and in the right place. Leave your painting worries behind because we strive to guarantee the avoidance of costly difficulties, adhering to Australian Standards and complying with all the Occupational Health and Safety guidelines. 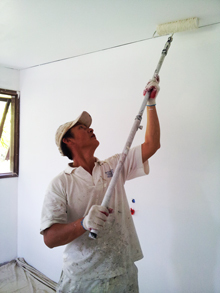 On top of that, we have the most qualified and reliable strata painters in Sydney. Getting your strata block painted can be costly and disruptive for your tenants and owners. Being the strata manager, you are, and you want you strata-painting project to be done quickly and smoothly. Whatever you strata painting project is, from the interiors to the exteriors including the epoxy floorings, A One Korean Painting can do for you. The Services that A-One Korean Painting offers is built on one goal – To make your life easier. Complimentary Color Consultation – you don’t need to have to make costly mistakes. We will give you advice on what will work for your strata painting. Incorporating Climate Factors – we understand the climate in Sydney and will give you the right products. Free Site Inspection – We need to understand the full scope of the project. Full Written Quote – You will have a comprehensive quote you can present to your owners or committee members to approve. Dedicated Project Manager – Our project manager will handle all the coordination for your strata painting Sydney, taking the work out of our hands. Insurance Coverage for your peace of mind.